One of the colors predefined by the Colors class (static properties), or one of the other named colors. See Remarks. A three-character hexadecimal value. The first c specifies the color's R value, the second character specifies the G value, and the third character specifies the B value. For example, 00F. A four-character hexadecimal value. The first character specifies the color's A value, the second character specifies its R value, the third character specifies the G value, and the fourth character specifies its B value. For example, F00F. A six-character hexadecimal value. The first two characters specify the color's R value, the next two specify its G value, and the final two specify its B value. For example, 0000FF. An eight-character hexadecimal value. The first two characters specify the color's A value, the next two specify its R value, the next two specify its G value, and the final two specify its B value. For example, FF0000FF. The color's ScA value as a value between 0 and 1. ScA is not exposed as a Color property directly. A Gets or sets the sRGB alpha channel value of the color. B Gets or sets the sRGB blue channel value of the color. G Gets or sets the sRGB green channel value of the color. R Gets or sets the sRGB red channel value of the color. Equals(Color) Tests whether the specified Color structure is identical to the current color. FromArgb Creates a new Color structure by using the specified sRGB alpha channel and color channel values. ToString(IFormatProvider) Creates a string representation of the color by using the ARGB channels and the specified format provider. Equality Tests whether two Color structures are identical. Inequality Tests whether two Color structures are not identical. The Silverlight implementation of Color does not support Color.FromRgb. The Silverlight 2 implementation of Color also does not support synchronized properties that report both the sRGB and scRBG values; only the sRGB values are reported as properties. It is possible to specify a Color using an scRGB format string, but this requires a deliberate XAML usage to access the type conversion behavior, along with Load. See Using XamlReader.Load. The XAML attribute usage, which infers properties that use the Color type and uses a type converter to process the attribute string into the specific values for the Color. A property element usage, containing a Color object element. For that object element, set the Color properties using initialization text, as shown in the XAML Object Element Usage. The XAML object element usage (with initialization text) is useful for declaring a Color as a resource in a XAML ResourceDictionary. A predefined color can either be a static property name of Colors, or one of the other color names that can be processed by string type conversion. The following are the 16 colors that can be set in code using a static property value of the Colors class, or set in XAML by setting an attribute to their name string. There are additional predefined named colors that do not have static properties on the Colors class that store their values. Instead, from-string type conversion behavior is enabled when parsing the attribute in XAML. 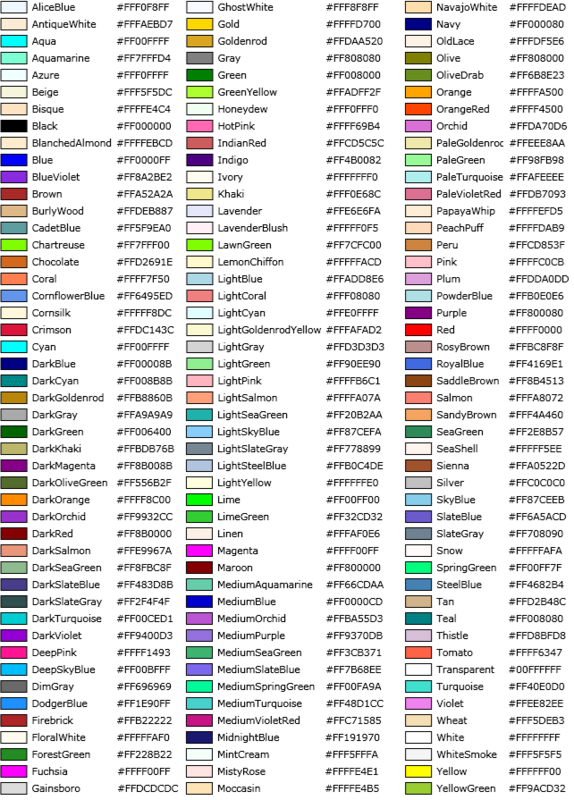 The following is a table of the available named colors (which includes the 16 colors that have static properties available). Note that setting a color by this means is possible directly when setting a Brush or Color value as a XAML attribute, but setting the colors in code for the colors that are not specific Colors class static properties takes some indirection, as is described in the next section. in Silverlight 2, setting predefined colors in code also uses the type conversion behavior, combined with XamlReader.Load. You must create an instance of an object element with a property of type Brush or Color, specifying the value of the property as one of the predefined color names. Then you can retrieve either the Brush or Color from the created object. In the case of the Brush (which will be a SolidColorBrush), you can also retrieve its Color property. You do not need to attach your created object to the element tree, you are using Load here as a construction mechanism that can access the predefined color string type conversion behavior. This same technique can be used to create colors from scRBG strings, or even sRGB strings (although for these it might be more convenient to use the FromArgb method, first splitting the string and performing math operations on the A,R,G,B atoms to match the FromArgb 0-255 scale). The following is example code for using the XamlReader.Load technique to create both a Brush and Color from a predefined color name.